In 1941, after suffering severe damage from wartime air raids, St Joseph's Approved School for Roman Catholic Girls at Arno's Vale in Bristol was evacuated to temporary premises at Eagle House, 23 Church Street, Bathford. In 1946, St Joseph's moved to a new permanent home at Ashwicke Hall, Ashwicke Road, Marshfield, in south Gloucestershire. The Hall lies very close to the county border with Wiltshire, and is sometimes placed in that county. In 1948, the premises were certified to accommodate 58 Senior Girls aged between their 15th and 17th birthdays at their date of admission. The residents of the School had a lucky escape when fire broke out in a ground-floor linen room at around 3a.m. on April 9th, 1948. Fortunately, the building was quickly evacuated and there were no casualties, although the east wing of the building was destroyed. In 1973, the school became an Assisted Community Home with Education (CHE) run in conjunction with Bristol County Borough Council. St Joseph's finally closed in the late 1970s. 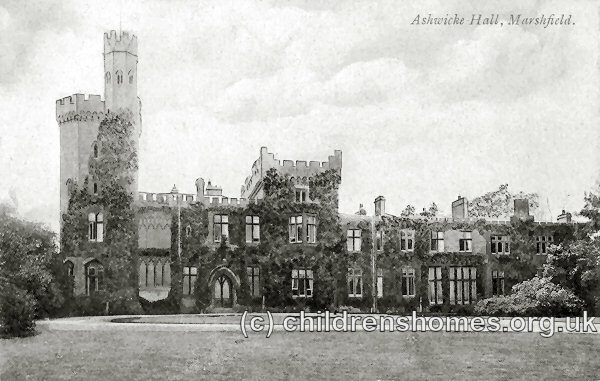 The premises were subsequently occupied by the Ashwicke Hall School. The National Archives, Kew, Richmond, Surrey, TW9 4DU. Has a few inspection reports.